How do you explain indulgences to 12-year-olds? It’s easy enough to give them a definition and conclude with the generalization “there were corrupt practices in the Church and people were angry about them.” However, this doesn’t really get at the root of the problem, which is: Why did people care so much about sin and salvation that they were willing to shell out money to buy indulgences? How did they understand Heaven and Hell? The point students need to understand is that late medieval people – or at least some of them – were terribly frightened at the prospect of Hell (for themselves and for those they loved.) The question of what a person had to do for salvation was a huge concern when there was a possibility of burning in a pit of fire for eternity. 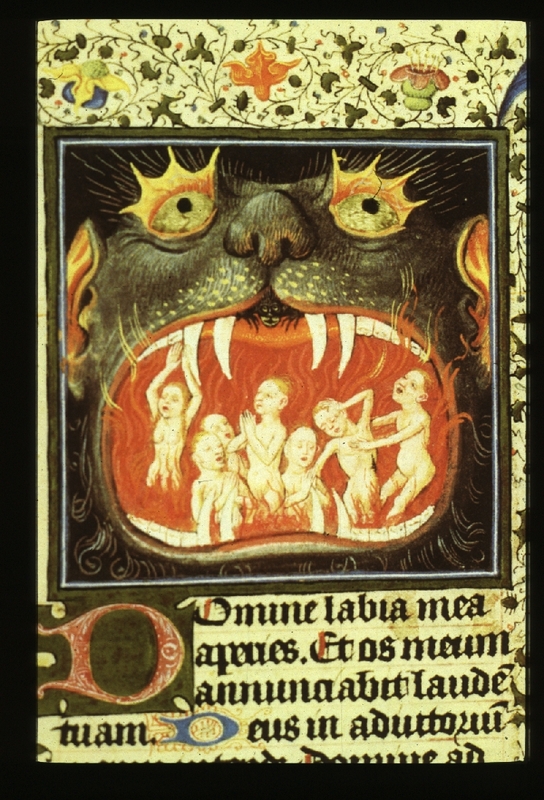 This is an illustration, entitled the Mouth of Hell, from a fifteenth-century book of hours, made for Catherine of Clèves. A book of hours was a private prayer book, designed for quiet reading and meditation in one’s chamber. However, this illustration looks like a cartoon for a horror movie. Why was the portrayal of Hell so graphic? With such visual reminders of one’s fate after death, how could believers feel confident that they had performed all the penance necessary to cleanse their souls? This type of illustration was not uncommon, either. Consider this larger mosaic of the Day of Judgment. It is a huge feature, perhaps 30 feet high, covering the entire back wall of the Torcello Basilica in Venice. This mosaic is done in Venetian-Byzantine school, created in two phases, during the twelfth and thirteenth centuries. On the top level, Christ has broken the doors of Hell and tramples on the devil. Christ has descended into Limbo and uplifted Adam, Eve, and Kings David and Solomon. John the Baptist points at Christ, the sixteen prophets are behind him, and the archangels Gabriel and Michael stand at each end. Notice that there is a red trail (representing his blood) running from the figure of Christ down through the rest of the mosaic. On the second level, Christ appears as the Judge. The Virgin Mary stands on his right and John the Baptist on his left. 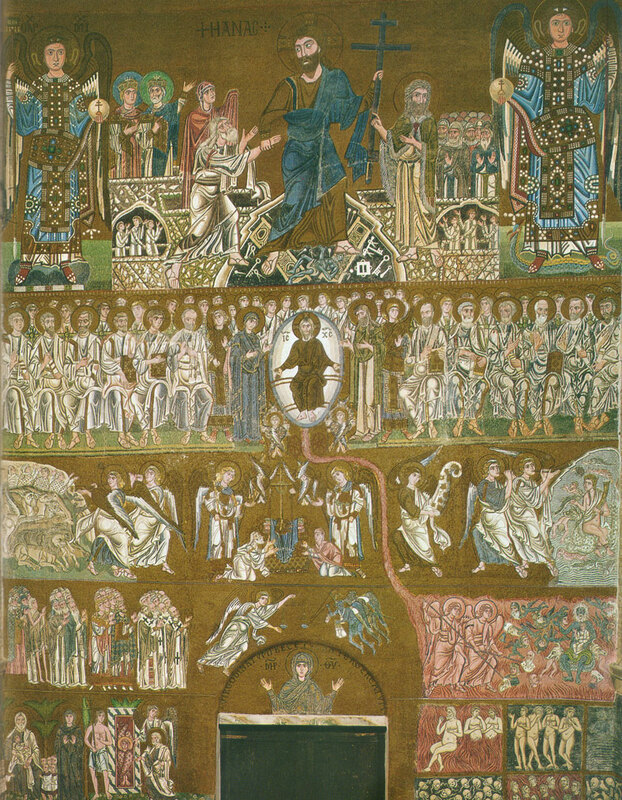 Seated on either side are the disciples, and angels are in the back row. On the third level, Adam and Eve are preparing the divine throne for the judgment. Between the archangels Michael and Gabriel are the scales of judgment. Medieval people believed that on the Day of Judgment the angels would weigh every soul. If the sins were heavier than the good deeds and penances of the soul, the soul would be damned to hell (or sent to purgatory for a number of years.) 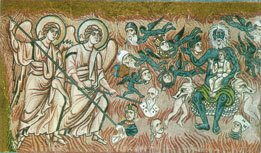 On the right side, an angel calls up the dead who have been eaten by wild animals (notice the beasts vomiting up bodies.) On the left side, another angel calls up the dead who were swallowed by sea monsters. The lower two levels show the fate of the good souls (on the right) and the damned souls (on the left.) On the Paradise side, bishops, martyrs, monks and holy women pray for God’s mercy. Below is the Adam with the souls of just men and the good robber from the Crucifixion. An angel guards the door of Paradise, and St. Peter is in front of it, bearing his keys. On the Hell side, angels drive the proud souls into the fire, while the devil sits with the antichrist on his lap. Below are the punishments in Hell for each of the 7 deadly sins: pride, lust, gluttony, anger, envy, sloth, miserliness. Notice the heads of prominent and wealthy people – nobles, kings and high clerics. No one was safe from Hell. Maybe this is just too graphic for a twelve-year-old. But I do think it drives home the point that salvation was very important to these people. The Mouth of Hell illustration is from the Book of Hours of Catherine of Clèves, 1440, Morgan Library, New York. The Torcello Day of Judgment Mosaic photos were taken by the author.